What’s An Ethiopian Christmas In London Like? Sejal Sukhadwala What’s An Ethiopian Christmas In London Like? 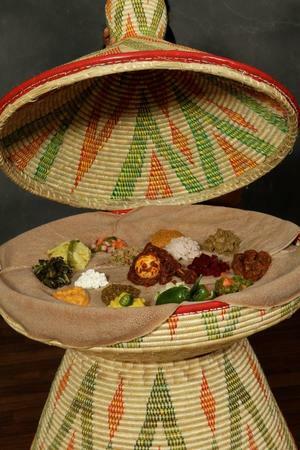 Sophie Sirak-Kebede is an extremely knowledgeable and articulate authority on Ethiopian food, drink and traditions. She also once owned the brilliant Tobia restaurant in north London, and although that restaurant eventually closed there are plans to open another one. She describes herself as “a typical Amhara” from the Amhara tribe (Showa-Menz region on her mother’s side, and Gondar on her father’s). She now lives in Queen’s Park. She’s co-founder of Tobia Teff, an online business that sells organic products made from teff — a highly nutritious Ethiopian grain that’s rapidly becoming fashionable and touted as ‘the next quinoa’. “Ethiopian Christmas is traditionally celebrated on 7 January — but as we’re Christians, we celebrate the Latin Christmas on 25 December as well. We start celebrating from the advent period onwards really, from the end of November. 25 December is more about the tree and presents. On that day, we’ll have a European-style Christmas meal of a leg of lamb or mutton with all the trimmings. I don’t really like turkey — it’s too dry — so maybe I’ll have goose. We’ll also have Christmas pudding. But the traditional Ethiopian Christmas is different altogether. The fasting period starts from around 26 or 27 November — the start of advent — and many people follow a strictly 100% vegan diet at this time. On 6 January, we go to the church at 10pm, and we’re there until around 4am the next morning. It’s a very ancient church that follows old traditions that haven’t changed at all over the years. We take the children with us too, and some people bring food to break the fast at 3am, until the priest tells us we can go home. Most of the time we just take a small bite to eat as a token gesture, and only eat properly when we get home. At around 11.30am-noon on 7 January, all of the family gets together and we have a typical Ethiopian feast, for which all the preparations have been done the day before. It’s traditional for younger members of the family to phone or visit the older ones; we never do it the other way round. After the advent fast, nobody wants to eat vegan on Christmas Day! So much so that some people turn up their noses at the sight of vegetables. 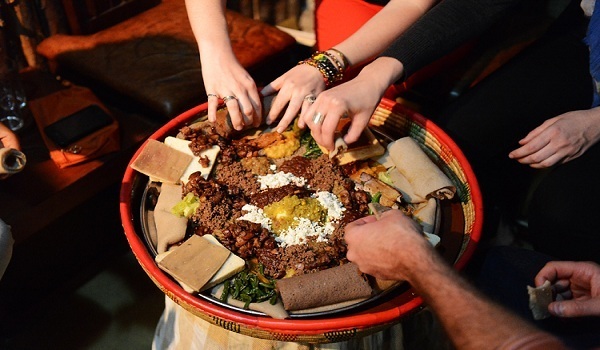 In a mosob (woven basket), we place injera (sourdough pancake-like flatbread). The absolutely central dish is doro wat — chicken and egg stew in paprika sauce with clarified butter. The chicken is cut into twelve pieces in a way that is an art in itself, and twelve hard-boiled eggs are also added. Like in many religions, the eggs represent ‘no beginning or end’, and the number twelve is symbolic of the twelve disciples. There might be other types of wats (stews) too, made from minced lamb or beef — but there’s no pork or shellfish in our diet. Additionally, we’ll have beg alicha, a mild lamb stew in turmeric sauce. Alicha means ‘no red’ — without chillies. There’s also kitfo — Ethiopian steak tartar — made from highly spiced minced beef with clarified butter; plus cubes of raw beef to be dipped into various condiments called awaze. Eaten with this is ayib: Ethiopian spiced cottage cheese with spinach. Another important dish is dulet, in which lamb tripe is washed extremely thoroughly to remove all the dirt and other bits and then soaked in lemon juice. It’s mixed with fried lamb’s liver, beef mince, chopped red onions and chopped green chillies, and seasoned exactly like kitfo, with clarified butter. The most important thing in an Ethiopian meal is that there’s only one communal plate for everyone — absolutely everyone breaks the injera together and dips into the stews together. This is very much a sign of togetherness. We believe he who shares his plate is together with his family, even in times of crises; and he who eats alone, dies alone. Of course, this also includes guests and anyone else who comes to the door. Traditional Ethiopian dishes are served at this intimate and well-priced restaurant tucked away off Caledonian Road. This Caledonian Road restaurant is one of London’s best known and most popular Ethiopian eateries — it’s cheap, cheerful and very often buzzy. A café and deli near Finsbury Park, selling Ethiopian ingredients and serving homely dishes. A family-run Camberwell restaurant specialising in traditional Ethiopian coffee ceremonies, along with traditional cooking. What’s A Russian Christmas In London Like? What’s A Goan Christmas In London Like? What’s An Italian Christmas In London Like? What’s A Spanish Christmas In London Like? What’s A West-African-Greek-British Christmas In London Like? What’s A German Christmas In London Like?